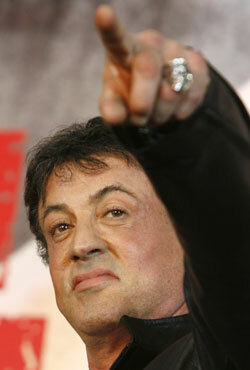 I had heard that Rocky and Rambo star Sylvester Stallone, 62, had a maternal grandfather who was a Russian Jew. His other grandparents are not Jewish. As one might guess from his name, his father’s family is Italian Catholic. Stallone’s mother Jackie Stallone has mentioned the family’s Jewish background in a few interviews but didn’t give any details. I couldn’t find any interviews in which Stallone talked about his Jewish ancestry. But in early April, the British newspaper the Daily Mail ran a fascinating piece about Jackie’s journey to the former USSR to research her roots. It involves the KGB, one of Ukraine’s richest men and personal assistance from Mikhail Gorbachev–and, if the Mail‘s research is to be believed, it’s all apparently true. Sylvester Stallone plans to visit his remaining relatives in Odessa, Ukraine, this summer. Woody Allen‘s new film, Whatever Works, is already out in many theaters. Allen’s back filming in New York and the main character, again, is a neurotic, older New York Jew much like Woody himself. This time Jewish comedian Larry David, 62, plays the Allen character. It’s another Allen May-December romance film with David falling in love with a much younger eccentric Southern belle, played by Evan Rachel Wood, 22. As in Allen’s 1979 film, Manhattan, much of the story revolves around the reaction of others to the mismatched couple. Almost nobody is as well suited as Wood, by virtue of their personal biography, to play the role that Wood plays in Whatever Works. She can appreciate both the Southern and Jewish aspects of the film’s main characters. Her mother is Jewish, but she is also Southern. Both her parents are North Carolina natives and Wood was born in Raleigh, N.C., and spent some of her childhood there. Question: Evan, can you talk about your real mom? Was she ever all up in your romantic life? Evan: She made every boyfriend in my life miserable. And, absolutely, she gets up in my business. She’s a Jewish mother, too. A Jewish, Southern mother, so I definitely went through the wringer. Wood dated rocker Marilyn Manson, now 40, for two years. They got together in 2006, when she was just 18, and dated through the end of last year. In a recent interview with entertainment news service Wenn.com, Wood called her romance with rocker Marilyn Manson “a bad idea,” and suggested that young girls shouldn’t date much older men. She added she would have turned down the chance to work with Woody Allen on his new film Whatever Works if her character’s relationship with David’s went too far. Opening June 26, Chéri stars Michelle Pfeiffer, 50, in another May-December romance. It is early 20th century Paris and Lea (Pfeiffer) is considering retirement from her “position” as the most famous seductress/courtesan of the rich and famous. Before making her decision, she is approached by a former courtesan and rival, played by Kathy Bates, who asks Lea to teach her 19-year-old son, played by Rupert Friend, a thing or two about women. Based on a novel by Collette, the film is directed by Stephen Frears, 68 (High Fidelity, Dangerous Liaisons). He’s also the movie’s narrator. I learned about Frears’ interfaith background in 2007 when he was nominated for an Oscar as best director for The Queen. Frears is the son of an Anglican father and a Jewish mother. He was raised an Anglican and didn’t know his mother was Jewish until he was in his late 20s. His brother told Stephen about their mother not long after Stephen married a Jewish painter, Annie Rothenstein. Shia Labeouf, 23, reprises his role as the hero in Transformers: Revenge of the Fallen, a sequel to the 2007 mega-hit, Transformers. As in the original, special effects are main attraction of this fantasy sci-fi flick. TBS is premiering two specials this coming weekend. Comedian Ellen DeGeneres hosts Ellen’s Longer, Wider Show on Saturday, June 27, at 9 p.m. Her guests include magician David Blaine, 36, and musician Kanye West. Blaine is the son of a Jewish mother and a Puerto Rican Catholic father. His parents split up when he was very young and he was raised in Brooklyn and New Jersey by his mother, a schoolteacher. His mother’s death in 1995 (she was only 49) was a severe blow to Blaine. It came just before he became really famous. Martin Short, a very funny guy who I think has the most Jewish comedy style of all comedians who aren’t Jewish, hosts Let Freedom Hum on Friday, June 26, at 10 p.m., on TBS. Short is of Irish Catholic background but has remarked that most people think he is Jewish. Short’s special features four lesser-known but funny stand-up comics. One is Jeremy Hotz, 43, a South African-born, Canadian Jewish comic who is very popular in Toronto. Hotz’s wife is Muslim and sometimes he makes comic or wry observations about his interfaith marriage. Poreda is considered a very hot prospect in the White Sox minor league system and was on the major league club’s roster until the last day of spring training, when he was sent down for a bit more seasoning … Poreda [the son of a Jewish mother] was raised religiously Jewish and always wears a chai while pitching. He talks about his religious upbringing and Jewish identity in an interview with the Pittsburgh Jewish Chronicle. Well, Poreda made his major league debut with the Chicago White Sox on June 13. His friends and family in were in the stands for his first big league appearance. The southpaw, who can really throw “heat,” did great in two innings of relief–not giving up a hit and striking out three out of the six batters he faced. One of those strike-out victims was Milwaukee Brewers slugger Ryan Braun, 25. Braun was the 2007 Rookie of the Year and was named to the All-Star team last year. He’s the son of a Jewish father.